From social media mania, our followers, likes, over commitments, the constant feeling of being overwhelmed, to the ongoing need for perfectionism. The exhausting pursuit of happiness. Over Expectations. Keeping up with the Joneses. Written honestly, for today’s woman; any age–young or old. Whether single, married, a mother, or a grandmother. This is not just a one-time read, to run out and fix yourself in one day. I found myself bookmarking so many pages, for continued daily devotion to empower. To be your best—and time for your weary soul. A book you will want to refer to daily- as a journal. 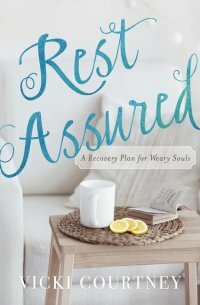 One to use as a prayer guide on your road to being Rest Assured.